NASHVILLE, Tenn., April 20, 2018 – Many U.S. hospitals today make staffing, patient care and business decisions based on what they expect to be solid data. But many times, the information is flawed. Healthcare facilities should, instead, be looking at real-time, actionable, point-of-care data that can tell a hospital as much about the health of their organization as it can the health of their patients. So believes Amplion Clinical Communications, a company that’s disrupting legacy nurse call, helping hospitals improve patient care, patient safety and patient/ staff satisfaction. In their newest eBook: “Are You Flying Blind? 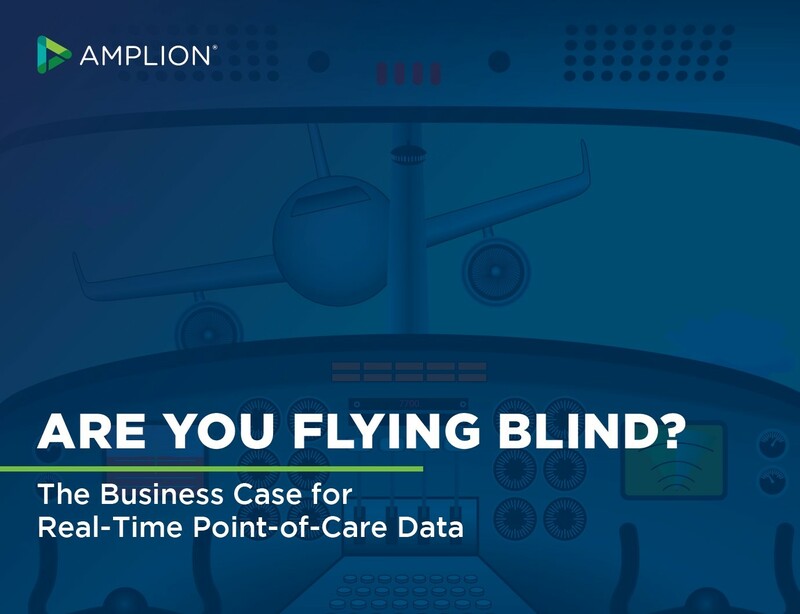 The Business Case for Real-Time Point-of-Care Data,” Amplion makes a business case for the decision support available from their nurse call analytics. Fortunately, more and more healthcare facilities today are reducing their capital costs by replacing expenses with more effective technologies, Grant reported. They’re demanding a quantifiable return on their investment by measuring and delivering on key performance indicators. In fact, as the eBook points out, four KPIs that have proven to aid caregivers in making sound operational and clinical decisions include patient safety, patient satisfaction, operational efficiency and turnover. Patient safety. Patient falls and pressure ulcers are two events that never need to occur. Not only do they increase a hospital’s operational cost and length-of-stay, but they also open the facility to possible legal action. Amplion states that with real-time, point-of-care data, caregivers tend to round more regularly for those patients at a higher risk for either, greatly reducing these occurrences and their impact. Patient satisfaction. Since HCAHPS scores place two percent of Medicare reimbursement at-risk, hospitals instinctively understand the importance of patient satisfaction. The biggest hindrance, however, is that survey data usually comes back weeks following the care -- too late to make timely improvements that could affect scores. Hospitals that have harnessed actionable data, Amplion affirms, now have the opportunity to immediately increase patient communications, improve staffing visibility, enhance rounding and patient response times, leading to higher patient experience scores. Operational efficiency. Amplion’s data has enabled clinical leaders to staff each shift based on real-time patient needs. That’s helped caregivers optimize staff resources, reduce burnout rates, increase nurse retention and improve clinical performance. Turnover. Eighty-two percent of nurses report a significant level of workplace stress and seventy percent admit they’re burned out in their jobs. With documented cost estimates of $82,000 to replace a registered nurse, reducing turnover can be one of the most substantial avenues to a hospital’s cost reduction efforts. Using bedside data, high performing nurses can be identified, rewarded and retained, while those needing coaching can be mentored into higher performing employees.